Chrysant sgl. Cobra is a disbudded, single headed cut flower. It is approx. 72cm and wholesaled in Batches of 10 stems. Chrysanthemums, (otherwise known in the trade as Xanths), are one of the oldest known flowers, dating back to the 15 century BC when they were grown as flowering herbs by the Chinese. The ancient city of Xiaolan Town was renamed Ju-Xian – meaning ‘Chrysanthemum City’. 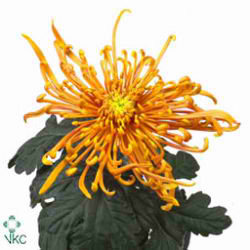 The Chrysanthemum was later introduced to Japan in the 8th century AD and the ruling Emperor adopted the flower as his official seal.